Thought that chain restaurants had reached peak-quirkiness with Taco Bell's burrito socks and KFC's drumstick corsage? 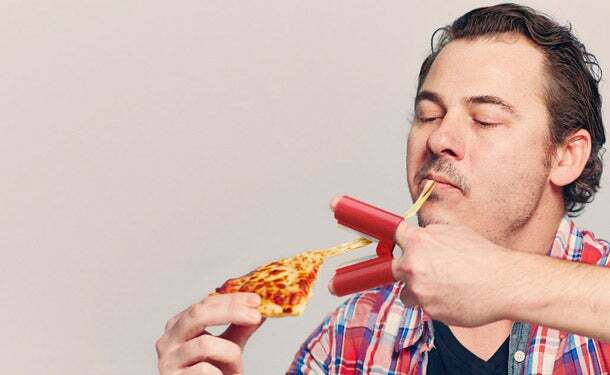 Canadian pizza chain Boston Pizza is ready to prove you wrong with items like a cake made of pizza and ergonomically-designed pizza cheese clippers. The wacky offerings are part of Boston Pizza's Pizza Game Changers campaign. The campaign, which launched on Monday, allows customers to vote online for their favorite of eight innovative – or just plain bizarre – products. 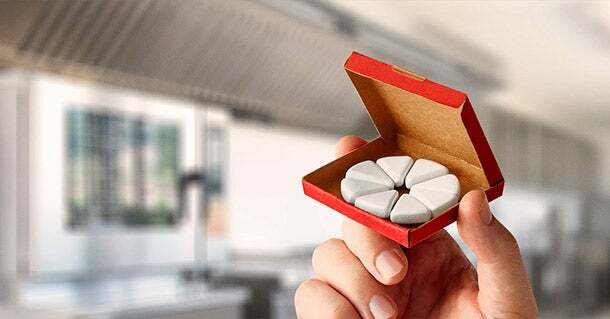 In addition to the Pizza Cake and cheese clippers, options include pizza mints, a gas powered pizza cutter and a pizza protector guaranteed to keep hungry roommates away. Pizza Game Changers campaign promotes Boston Pizza's new menu items, which are quirky offerings in their own right. Menu additions include the Pizza Taco (a chipotle chicken or pulled pork taco with a pizza shell), Sriracha Chicken Pizza and Pizzaburger sliders. "The Pizza Game Changers campaign is really about celebrating innovation in our pizza over the last 50 years," says Boston Pizza spokesperson Perry Schwartz. "As part of bringing items like the Pizzaburger, Taco Pizza, Calzono and Sriracha Chicken Pizza to market, we’re also taking a humorous look at some other potential innovations that we can bring to market and involving the Boston Pizza Guest in that process." The top item, as voted by customers, will be brought to market this summer. While the logistics are still being sorted out, Boston Pizza is planning "something special" for the winning innovation. "Right now the Pizza Cake is leading the pack and given that it’s our 50th anniversary, we might be blowing out some candles on a 50th Pizza Cake down the road," says Schwartz. Sadly for Americans craving a slice of Pizza Cake, the campaign is currently based in Canada, where Boston Pizza has more than 350 restaurants. However, the chain's sister brand, Boston's, which has over 40 restaurants in the U.S., may look at leveraging some of the menu items and campaign elements at a later point.